The VN-Index, which gauges the fluctuating values of 228 companies and four close-ended funds listed on the Ho Chi Minh Stock Exchange, slid below 510 on May 18, due to wariness among investors. The market closed at 508.3, down 2.97 points (or 0.58 percent). 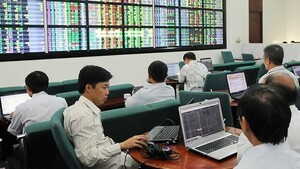 Market liquidity fell sharply to the tune of 45.3 million shares, worth VND1.42 trillion. On the city bourse, 58 stocks gained, 139 dropped, and 35 remained unchanged. Viet Nam Fumigation Joint Stock Company (VFG) lost 15.61 percent to trade, dropping from VND86,500 to VND73,000. Becamex Infrastructure Development Joint Stock Company (IJC) and Viet Nhat Seafood Corporation (VNH) finished the day trading at 5 percent over yesterday’s rate, climbing VND30,400 and VND17,100 respectively. Ben Thanh Trading & Service Joint Stock Company (BTT) lost 4.92 percent to VND40,600. Market researcher Ma San Group Corporation (MSN) surged by 4.99 percent to VND46,300, making for three consecutive sessions of gains. Nam Viet Corporation (ANV) rose by 4.9 percent to trade at VND21,400, up from VND20,400 yesterday. Idico Urban and House Development Joint Stock Company (UIC) rose 4.84 percent to VND32,500. Saigon Securities Inc. (SSI) continued to hold its post as the most active stock in volume, trading 2.37 million shares. Saigon Commercial Bank or Sacombank (STB) followed with 2.1 million shares, while Ocean Group Joint Stock Company (OGC) finished with 1.32 million shares. Red also covered the smaller bourse in the north, as the Hanoi’s HNX-Index tumbled 2.59 points, or 1.53 percent, down to 167.02. Trading volume dropped to 33.8 million shares, worth VND1.2 trillion. The Hanoi Stock Exchange announced the forthcoming suspension of the HCMC-based ceramic tiles producer Vitaly Joint Stock Company (VTA), due to be imposed between May 24 and June 4. The penalty comes in light of the company’s reported profits after taxes, taken from audited financial statements in 2008 and 2009, which revealed negative numbers. The UPCoM-Index slightly rose by 0.08 points, or 0.16 percent, to 51.26. A total of 51,895 shares valued at VND1.1 billion changed hands.